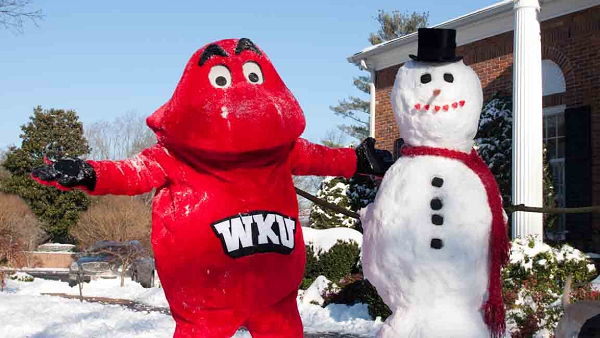 Big Red, a red furry blob created by Ralph Carey in 1979, is the WKU mascot. Courtesy of WKUphoto. Western Kentucky University is a public university in Bowling Green, Kentucky. It was founded by the Commonwealth of Kentucky in 1906, though its roots go back to 1876 when A. W. Mell founded the Glasgow Normal School and Business College. Western Kentucky University sits atop a hill standing 232 feet above the Barren River, thus the nickname “Hilltoppers.” WKU is home to more than 21,000 students, including homeschoolers. The largest dormitory on campus, and the second largest in the United States, is Pearce-Ford Tower. WKU students enjoy a vibrant, scholarly environment. They are encouraged to become involved in community service, applied research, and study abroad. Each semester, WKU sends some students to Harlaxton College in Grantham, England, while other students circumnavigate the globe with the Semester at Sea program, as well as participate in faculty-led and exchange programs throughout the world. WKU also offers fifteen associate degree programs, five certificate programs, and thirteen graduate degree programs, as well as Online Distance Learning Degrees. WKU is home to many highly ranked and nationally-recognized academic programs such as Education, Engineering, Business, Journalism and Broadcasting. In fact, WKU’s School of Journalism and Broadcasting regularly ranks among the best undergraduate journalism schools in the nation. As of 2007, twenty-seven alumni of WKU’s photo and print journalism programs had been awarded thirteen Pulitzer Prizes, including eleven alumni recognized for their coverage of the 1988 Carrollton bus crash. The school publishes a twice-weekly newspaper, The College Heights Herald. Western Kentucky University’s forensics (speech and debate) team is also consistently ranked as one of the country’s best. They have won the American Forensic Association (AFA) and National Forensic Association (NFA) national championships multiple times since 2003. It has also won the International Forensic Association’s (IFA) international championship every year it has attended. They remain the nation’s only team to win the AFA, NFA, IFA, and NFA debate championships in the same year, a feat it has accomplished multiple times. The team hosts several tournaments for high school students each fall, as well as a large speech and debate summer camp each July. WKU’s Department of Folk Studies and Anthropology is unique in that it offers a master’s degree program in folklore and is one of the few schools in Kentucky to offer a focus in historic preservation. Also, WKU was only the second university in America to offer a bachelor’s degree program in popular culture studies (the other being Bowling Green State University). Western Kentucky University is known as a place where all students can succeed. The college accepts below-average students with an average GPA of 3.27. However, you should try to do well on either the SAT or ACT. According to PrepScholar, aim for a 870 SAT or a 19 ACT or higher just to be safe. Homeschool/GED graduates may be eligible for a Kentucky Educational Excellence Scholarship (KEES) based on their ACT score. The acceptance rate at Western Kentucky University is 93%. This means that for every 100 applicants, 93 are admitted. Since they basically accept nearly every student who applies, for the most part you just need to submit an application to get in. But if you don’t meet all of their application requirements, you will be one of the few who gets rejected. WKU has online applications for undergraduate applicants, honors college applicants, dual credit high school students, other high school students (who want to take college courses that are not part of the dual credit program), graduate applicants, international applicants, and non-degree seeking students.